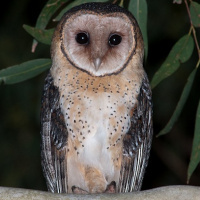 The Australian Masked Owl is a relatively large barn owl with large powerful feet, a rounded head and no ear-tufts. Pale and dark morphs are known to exist. Typical call - Healesville, Victoria, Australia. October 1988. © Ed McNabb. Description: Pale morph: The facial disc is white, with chestnut shading around the eyes, and a distinct rim speckled light and dark brown. The eyes are dark brown to blackish, and the bill is whitish. Upperparts, including the wing-coverts, are greyish-brown, peppered with white and black spots. The wings and tail are brownish-grey with a few darker bars. Underparts are white with coarse dark markings, which are often arrow-shaped. The feet are fully feathered to the base of the toes, varying in colour from whitish to orange-buff. The toes themselves are yellowish-grey to pale pinkish-grey, and slightly bristled. Claws are dark greyish-brown, with darker tips. 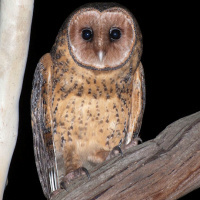 Dark morph: As above, but the ground colour of the upperparts and underparts is orange-buff, with the facial disc buff to pale rufous-brown. Size: Length 33-47cm. Wing length 290-358mm. Tail length 119-150mm. Weight 290-673g. Females are larger than males. 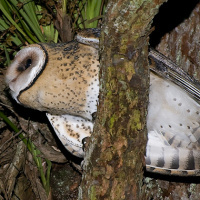 Habits: The Australian Masked Owl is a nocturnal, secretive bird. It roosts by day in dense foliage of tall trees or in hollow tree trunks, or sometimes in caves and holes between rocks. 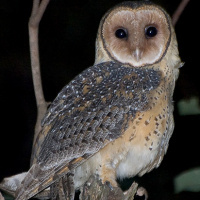 Voice: A screech similar to that of the Barn Owl, but louder and more rasping. There is also a wild cackling call that rises and falls in volume. Hunting & Food: The diet comprises mainly of small mammals up to the size of rabbits. Small birds and lizards are also taken. 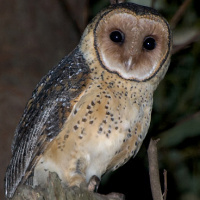 This owl hunts on the wing or from a perch. Breeding: Nests are normally in hollow trunks of tall eucalyptus trees, but eggs may also be laid on bare rock or sand in a cave. Normally 2-4 dull white eggs (approx. 43 x 49mm) are laid and incubated by the female alone, while the male provides the food. Nestlings fledge at 10-12 weeks. Habitat: Forest and open woodland with adjacent clearings. May use caves as a daytime roost. 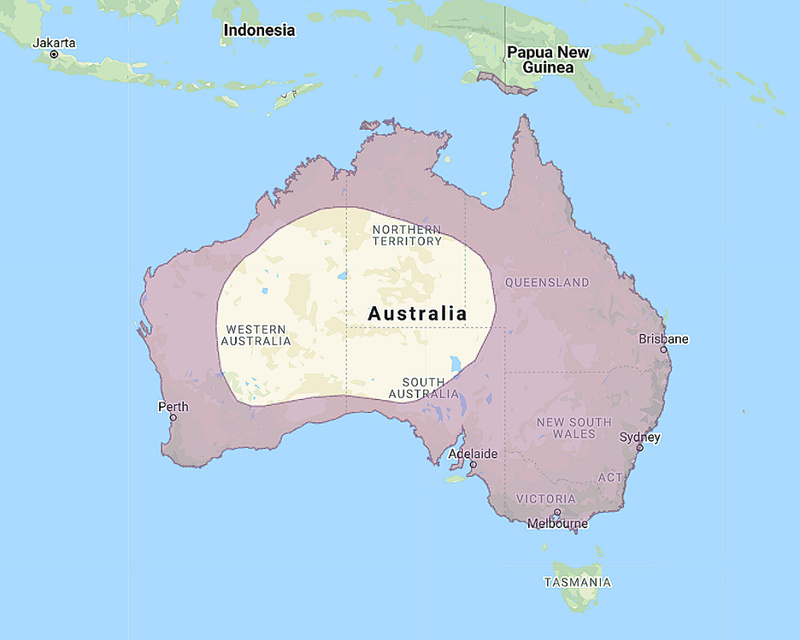 Distribution: Lowlands of southern New Guinea including Daru Islands, and much of Australia, excluding the arid interior. Original Description: Stephens, James Francis. 1826. General Zoology, or Systematic Natural History by George Kearsley Shaw. 13, pt. 2, p. 61. 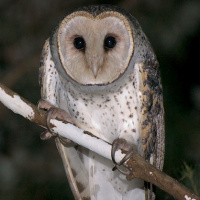 See also: Other owls from Asia, Oceania, Genus: Tyto. Page by Deane Lewis. Last updated 2016-03-17.